Heaven might be a myth but kheerganga isn’t. Hidden in the mighty Himalayas the journey is filled with its ethereal viewpoints, mesmerizing villages, good vibes and the magic of Parvati Valley. Kheerganga at the height of 10065 ft. is a trek that has become too popular of late, mainly due to the popularity of Kasol as a hippie’s joint. The best time to visit is between May – June and September – October, although I visited in January. This is what exactly makes my journey un-forgetful. The resplendent natural beauty of this trek is still untouched by the demons of commercialization and is only further accentuated by the simple life of the locals in the area. Through Nakthan Village and Tosh: (Recommended) This route is lined with exquisite panoramic views of the mountains and is preferred by the photography enthusiasts. This route is the most popular route to Kheerganga and traverses along the left side of the Parvati River. Through Kalga Village: Offering an easier climb, the second route to Kheerganga is comparatively easy and with longer descends. Not so popular, this route is lined with dense forests and does not offer as picturesque views as the trek from Tosh to Kheerganga. This route is generally preferred by people low on stamina. The tourist sees two but obviously for a traveler there is only one option. The distance of the trek is about 12 KMs which can easily be covered in 6-7 hours. The trek was not at all crowded because of the heavy snow and temperature. The trip begins from Barsheni dam, the temperature goes so high that the river freezes (Yes, I have proof). The first few kilometers were hardly a climb. Our trail went through lush farms, small hills, and villages along the Parvati River. We couldn’t help but stop at many points to let the beauty of our surroundings sink in. With not a single soul in sight, By the time we reached our first village The Rudranaag village, we were surrounded by thick snow. There is a waterfall near the village named Rudranaag Waterfall. This is where we decided to take a little break and eat Maggi noodles. Beyond Rudranaag, the woods became dense and the path became steeper. The local shopkeeper told us that this is a total uneven time to trek and usually very few travelers visit at this time of the year. He also warned us about the slippery ways ahead. As we moved ahead of the snow as well temperature started increasing. As we moved forward and villages passed by my eagerness to see what’s ahead started increasing. Kheerganga is considered a holy place with a hot water spring, a small temple of Lord Shiva and a bathing tank. After another hour of walking it started to snow, one of the things I ever experienced. After almost four hours of walking, I started questioning myself about trekking in the first place but the panoramic skies and vast forest covered in snow are a much-needed delight to the one’s eyes and especially the tired legs. Pro tip: Leave your bigger backpacks back in your inn and carry a super light overnight backpack instead. The last part of the trek demanded a strenuous climb. We saw a couple of groups coming down our way. One fat guy among them was not walking he was using the slope of the height to crawl, we had a little chat and he asked us to turn back as his words were “Bhai mat ja! Maut dekhi hain maine!” translates to don’t go I have seen death But the other guy from his group started laughing and told us to ignore him and enjoy the trekking. After another hour I asked myself – “Will it be worth suffering?” Strangely, right after that thought, all of a sudden I came across a sign that said: “Welcome to Kheerganga”. I was excited to see what is it that everyone brags about but all I could see was small steel tents all over covered with snow. By the time I reached, the evening was about to end, maybe that’s why I couldn’t see much. The place was covered by snow all over of about 3 feet. We hurried our self to find a place for night stay and charge phones. Surprisingly the power supply to kheerganga is only in daytime. My phone was dead but a friend had some battery left, so I asked him to switch it off. The food offering was limited to rice-dal and 2 chapattis per person. The dining area was different from a pre-installed tandoor. I was curious to know why would anyone put this in middle of dining place, the owner told me that at nights the normal temperature goes to -25 Celsius. It was quite a bummer for me, I didn’t believe him. The guy who owned that place was very friendly so he started chatting and gave us a couple of advice including peeing before going to bed. I didn’t understand his words at that time but I did it anyway. We went to bed. Surprisingly I woke up due to the sound of falling snow from the tent due to the wind, It was not late until I realized I have to pee again. I tried to control it as it was very cold, turnouts the guy was not lying about temperature. After half an hour of struggle I finally decided to pee quickly, I wore my shoes and went out. But what I saw that night was absolutely unexpected, the place was covered with snow all over with pine trees also partially covering themselves with snow. I walked down a few steps to find myself in the situation where my legs were almost fully submerged in snow. There were no clouds, it was a full moon night with all the Milky Way above me. The snow was reflecting the moon and stars so beautifully that I was convinced that if heaven does exist, this is it. I called my friends to witness the phenomenal view but due to the temperature issue none came out. I decided I’ll stay a little longer until I realized that my snow is making my shoes and jeans wet and I went back inside to the lovely warm bed. The view was such extraordinary and marvelous that I forgot to take photos. As there is a famous saying “True Beauty can only be felt”. The next morning we went to the famous hot water spring for which the kheerganga is really famous about. We saw a small pool on the highest point and we were told that the water from the hot springs is believed to be holy with healing properties. We spent a good 1-2 hours in the pool and the warm water treated our fatigue. It was again an iconic view to see a hot water spring with snow all around. The best thing was that no one apart from the locals was present at kheerganga, so the hot water spring was not at all occupied, It was all ours to bath. It was absolutely magic to be in hot water with the snow around. Kheerganga is an en-route to famous pin Parvati pass. 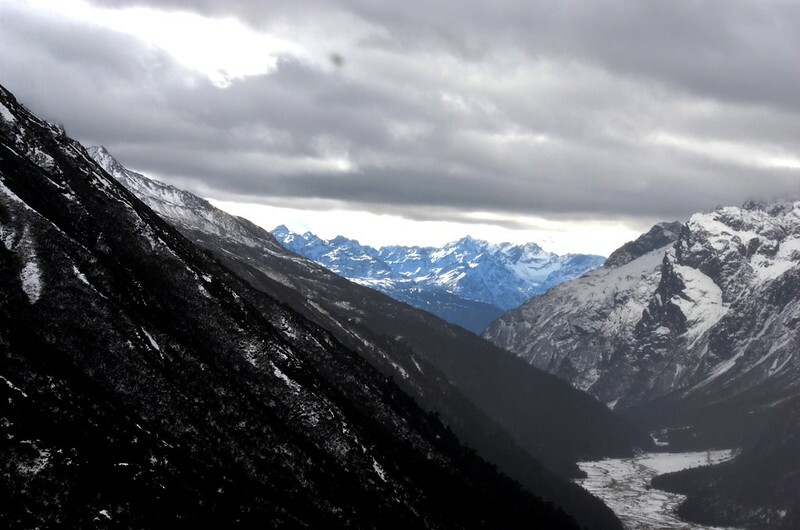 .Pin Parvati Pass Trek is known as a very tricky pass as it falls on high altitude and covered under frozen snow mountain for an almost whole year. Uncertain rainfall makes the trekking area slippery and increases the risk factor (11 Days usually). But this was destined for some other day. As every good thing comes to an end. The return was quick and mostly eventless. The way back took less time as compared to the trek for obvious reasons. It took us 3.30 hours to reach back to Barsheni as we stopped and chilled at many places. Make sure you carry warm clothes along with you no matter during whichever season you are traveling in. Be always prepared with your trekking gear and equipment. Carrying your own medication and a good pair of shoes is a must. Carry spare batteries for the camera or power banks for phones as there may be no electricity supply. You can reach Kheerganga by catching an overnight Himachal Tourism bus from Delhi to Manali but get off at Bhuntar. This will cost you 1000 – 1200 and the buses are comfortable. From Bhuntar, head to Tosh or Manikaran and acclimatize for a day and start your trek from here early morning. Don’t try to trek up and back from Kheerganga in a day unless you don’t mind getting lost in the mountains in the dark and becoming a treat for a Himalayan bear. A very nicely written post, I have never visited this side of India, but now I’m damn sure that I have to make a visit to this beautiful place, it will make a forever memory damn sure. Thanks Tanmoy, Great job.